Wits & Wagers is trivia made fun! This is the first trivia game you can win without knowing any trivia. How? By successfully betting on other playersâ€™ answers. So you can win based upon what you know or how well you know your friends. Wits & Wagers also brings out the excitement of a Vegas-style casino. Strike it big with one of the high payout answers and youâ€™ll be cheering like you just hit the jackpot! 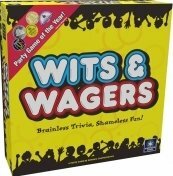 Wits & Wagers is a recipient of the 2006 Mensa Mind Games awards, the Major Fun award, and was called â€œthe latest in living-room playâ€� by Time Magazine. It is touted as the #1 rated trivia game of all time by industry experts at www.about.com and by hundreds of consumers at www.BoardGameGeek.com. The strength of this party game is that it can be enjoyed by gamers and non-gamers alike, making it a wonderful choice for large family reunions. Other products in the "Wits & Wagers" series. What a game! Mixes in a little trivia and a little betting (hence Wits & Wagers). The most fun part of the game is revealing the answers to the trivia to each other and laughing at how far off everybody is from each other ….AND eventually how far off we all are to the real answer….. It then becomes harder trying to figure out whom you think is really the closest – without going over (if anyone at all!). Fortunately, you can bet on different answers (or none of them) in case you really don’t have a clue! Of course the best part is when my answer is the closest to the actual answer and I am awarded a bonus :). Great for both strategy groups and party groups! This is one of the games I like to pull out when we have company over and are playing "party" games. It's a game you can play with varying ages - for example my 8 year old can play right along with me and along with my parents. I think it's fun to see how far people can be off with their answers. We almost always discuss the topics afterwards. It makes for a good learning session. As for the game mechanics, I like the multiple betting options that are available. It's not an "all or nothing" type bet. Wits & Wagers is the party game for people that don't like party games. Don't worry if you don't have the answers to the trivia questions, you can still win this game - you just need to place your bets wisely. There isn't a group that hasn't enjoyed this game. Must have for you game collection! A great party game to pull out when you have lots of people. The components are good quality and the questions are great. You can learn a lot of trivia from this game but you don't have to know a lot to win, just make the right 'wagers.' A good game to play with non gamers or to wind down an evening. Great game for big groups! The trivia is engaging and interesting and the fact that you're betting on how you think will know the answers adds a whole new level to the feel of this game. A game similar to trivia games. However you only go through 7 questions, everyone guess and than you can actually bid on the guess. You do not win the game by knowing all the answering, but by knowing who knows all the answers. . I've played this game with my very dedicated gamer friends... and also my in-laws. Both groups loved it. You can't go wrong with this one, even if you hate trivia!